VLANs create Layer 2 segments. End stations in different segments (broadcast domains) cannot communicate with each other without the use of a Layer 3 device, such as a router. Each VLAN must have a separate physical connection on the router, or trunking must be enabled on a single physical connection for inter-VLAN routing to work. The figure depicts a router attached to a switch. 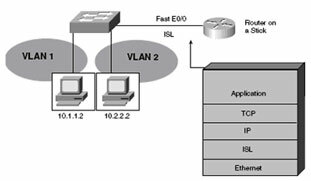 The end stations in the two VLANs communicate by sending packets to the router, which forwards them to the other VLAN. This setup is referred to as a router on a stick. Each company listed on the Internet is viewed as a single network. This network must be reached before a host within that company can be contacted. A two-part addressing scheme allows the IP address to identify both the network and the host. ISL trunking requires the use of subinterfaces. A subinterface is a logical, addressable interface on the router’s physical Fast Ethernet port. Several subinterfaces can be on a single port(one per VLAN). The encapsulation isl domain command (in subinterface configuration mode) enables ISL. The domain parameter refers to the VLAN domain number. In the figure, the FastEthernet 0 interface is divided into multiple subinterfaces (FastEthernet 0.1, FastEthernet 0.2, and so on). “Router on a stick” is a router attached only to a switch. The router receives packets from one VLAN and forwards them to another VLAN. A subinterface is required to support ISL trunking. To configure a router on a stick, enable ISL on the switch port connected to the router, enable ISL encapsulation on the router’s FastEthernet subinterface, and assign a network layer address to each subinterface. Routing is the process of getting packets and messages from one location to another. Static routes are manually entered by the network administrator. These routes must be manually updated whenever there is a topology change. Dynamic routes are learned by the router. Unlike static routes, topology changes are learned without administrative intervention and are automatically propagated throughout the network. Static routes specify the path packets take, allowing precise control over a network’s routing behavior. Static routes are sometimes used to define a gateway of last resort. This is where a packet is routed if no other suitable path can be found. Static routes are also used when routing to a stub network. A stub network is a network accessed by a single route. Often, static routes are the only way on to or off of a stub network. Static routes are also used for security reasons or when the network is small. The ip route command configures a static route in global configuration mode. This command manually sets the routing table. This table entry will not accept dynamic changes as long as the path is active. address—IP address of the next-hop router. interface—Interface to the destination network. Must be a point-to-point interface. distance (Optional)—Defines the administrative distance. permanent (Optional)—Specifies that the route will not be removed, even if the interface shuts down. A default route is a special type of static route. Use a default route when the route is not known or when storing the needed information is unfeasible. Routing is the process of sending packets from one location to another. A router needs to know the destination address, source address, initial possible routes, and best path to route packets. Routing information is stored in the router’s routing table. Static routes are user-defined, whereas dynamic routes are learned by the router running a routing protocol. 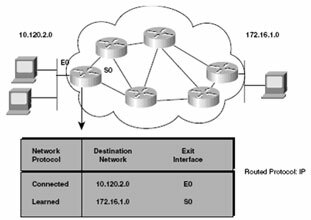 Use the ip route command to configure a static route. A default route is used for situations in which the route is not known or when it is unfeasible for the routing table to store sufficient information about the route.